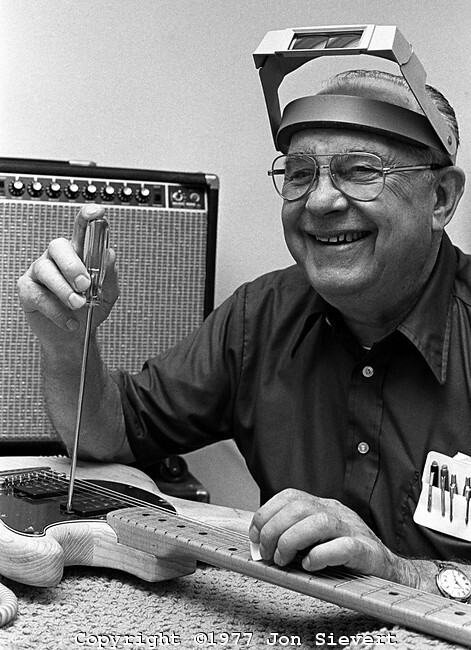 I’ve spent the last few months learning everything I could about Leo Fender, creator of Fender Musical Instruments, and I’ve come to the conclusion that, like the hedgehog, Leo had one guiding principle; his was: Make simple products for the working musician which can be quickly repaired. Leo Fender tinkering. Photo by Jon Sievert. Mr. Fender never bothered with a “mission statement,” which many firms try to have. Mission statements require precision of thought and clarity of vision, which is uncommon, so most mission statements confuse by including too much. Clarity requires exclusion. How did Leo Fender develop his vision? Because he got his start as a radio repairman. Folks came to his little shop in Fullerton, California, every day with a broken thing and they needed it fixed in hours, not days, because they made their living with it. And Mr. Fender became known as someone who could fix things quickly. As he was fixing amps and PAs made by others, he noticed what was wrong with the designs of the products. He got into making guitars– lap steels at first– so he could sell his amps. He decided guitars were too complicated and decided to simplify their construction to what was absolutely essential and could be quickly replaced without special skills or tools. Guitars of that time– we’re talking late 1940s here– were not always made by painstaking individual craftsmen, but they did take skill and time to make. If something went out of whack, as always happens even to the best guitars, it took a lot of skill and time to correct. 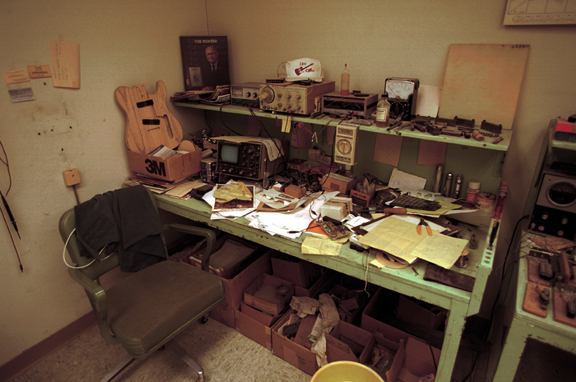 Leo’s guitars were a military-grade assembly of easily replaceable components. Other guitar makers scoffed at his “canoe paddle” solid-body instruments, but they didn’t laugh for long. And the amps Leo made, from tried-and-true circuits using the best hardware he could find– war surplus was cheap and plentiful after WWII– were solid, dependable and sounded great. No one laughed at those; they were too busy trying unsuccessfully to copy them. Without Leo’s vision, other guitar and amp makers most often tripped over their own feet. It might look like a Fender product but it didn’t play or sound like one. As long as Leo ran his company, his vision, like gravity, was always in effect. Leo wasn’t a socializer and he was thrifty to a fault. He was happiest tinkering with new ways to simplify and improve things and he’d only pal around with those who produced something with their hands. Leo didn’t design his products for rock and roll, because that wasn’t being played in the clubs and honky-tonks of his day. He and his assistants would take their prototype guitars and amps to local clubs where country guitarists worked, and have them try them on stage. Leo listened to the comments and criticisms he got from these working musicians and incorporated their feedback into the next prototype. When kids who grew up hearing country, gospel, blues, folk, rhythm and blues and other music got the early Fender products in their hands, it sparked a revolution in music. The hedgehog Leo, who never played guitar, wore hearing aids and hadn’t planned to help create rock and roll, was astonished. Happily astonished. And so were we. In this photo from 1950, Leo Fender is on the right. 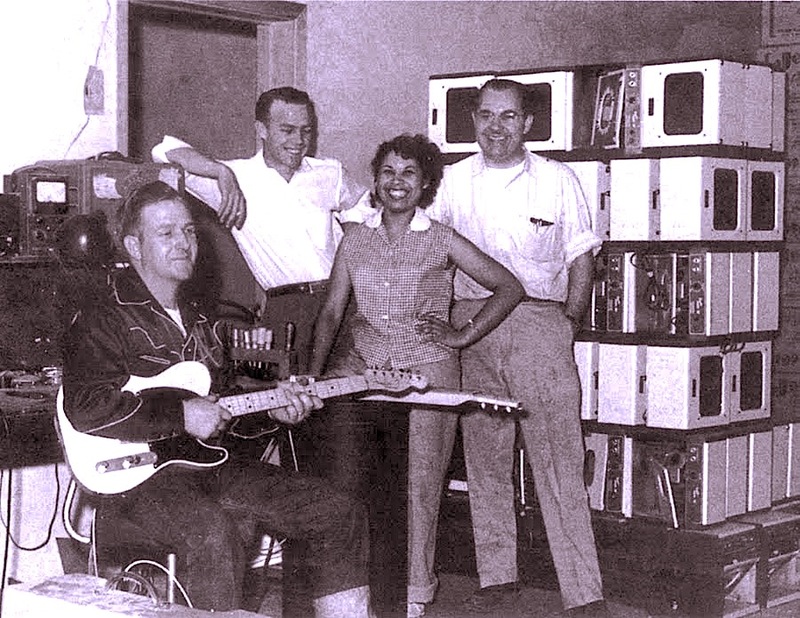 The player holding the Fender Broadcaster guitar is Dub Williams and the fellow behind him is singer/songwriter/bandleader Eddie Miller; together they wrote the classic “Release Me.” The woman hasn’t been identified. Leo sold Fender Musical Instruments to CBS, the TV folks, for a staggering amount of money in January of 1965, because he thought he was dying. He wasn’t, and CBS, full of foxes and savvy operators, ran Fender into the ground. Even teens like me realized the CBS-made Fender guitars and amps were less than what they had been, and a market grew for “pre-CBS” Fender products. Some brilliant Japanese craftsmen made a huge impact in the mid-1970s building guitars like Leo made them. They’d buy old Leo-made Fenders, blueprint them down to the tiniest detail, and replicate them precisely. I own one of their Stratocasters (a Tokai copy of the 1958 Strat Buddy Holly played), and I took it apart and put it back together until I “got it,” and then built my own version of a early-1950s “Leo” Telecaster. It’s my favorite guitar. It’s like a tank that sings. In 1985, CBS realized it couldn’t complete with the Japanese guitars or the early Fenders, threw in the towel and sold the company at a loss to some guitar guys, who took Fender back to its roots. Leo, when his non-compete with CBS ran out in 1975, founded Music Man and later G&L Musical Instruments. Both companies made guitars and amps that Leo thought were improvements to his earlier designs. Both companies, like the back-to-Leo Fender, are going strong today. Leo died in 1991. G&L has kept his unpretentious office/lab exactly as it was the last day he worked, a couple of days before he died. His coffee cup (a white styrofoam cup with “Leo” written on it with a Sharpie marker) is still on his work bench. Leo’s office as he left it. Photo by John Connell. Leo the hedgehog changed the world and did it his way.